Senior clerk Fraser McLaren and junior clerk Lucy Jenkins were delighted to hand over a cheque to staff of Suffolk Law Centre, enabling it immediately to improve its ability to meet clients’ needs. Suffolk Law Centre is the UK’s newest Law Centre. Founded by Ipswich and Suffolk Council for Racial Equality (ISCRE) as a new charity in April last year, Suffolk Law Centre offers free legal advice on issues such as Family, Immigration and Housing, as well as a free discrimination casework service, to people who cannot afford to pay legal fees. Audrey Ludwig, Director of Suffolk Law Centre, started the campaign to set up a Law Centre in Suffolk in 2013 out of concern for the impact on access to justice from the cuts to civil legal aid through LASPO. ISCRE and Suffolk Law Centre are co-located, on St. Matthews Street, Ipswich, and share office space and backroom staff. East Anglian Chambers is a Founding Patron of Suffolk Law Centre, and members and staff have been very generous in their fundraising contributions to the small charity. At their annual dinner in November 2018, proceeds of the raffle were donated to Suffolk Law Centre. This news could not have come at a better time for the team at the Law Centre. 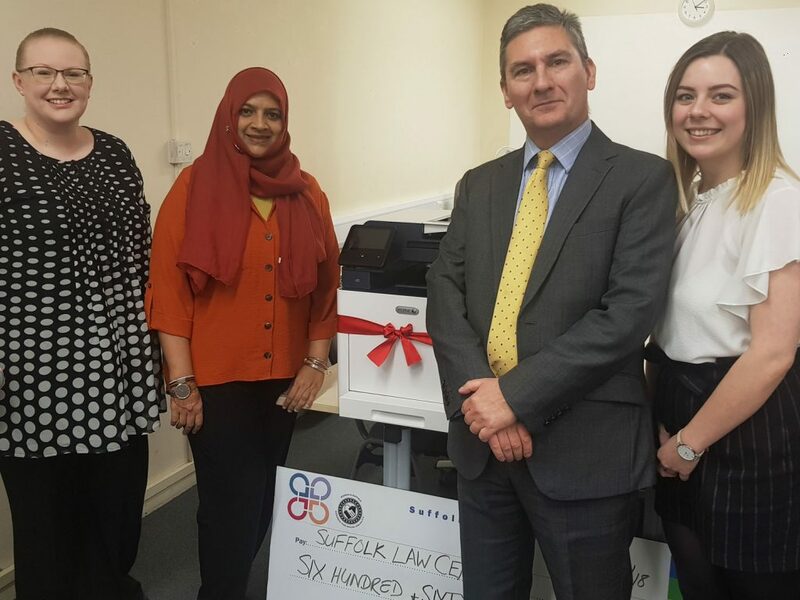 Photo: Sophie Hawkins and Sumaiyah Jeelani receive their cheque from (and show off their new printer to) senior clerk Fraser McLaren and Lucy Jenkins from East Anglian Chambers.